It is hard to believe that Jayne has just turned 3. She was born on New Year’s Eve 12 days early and brought with her so much joy to our lives. 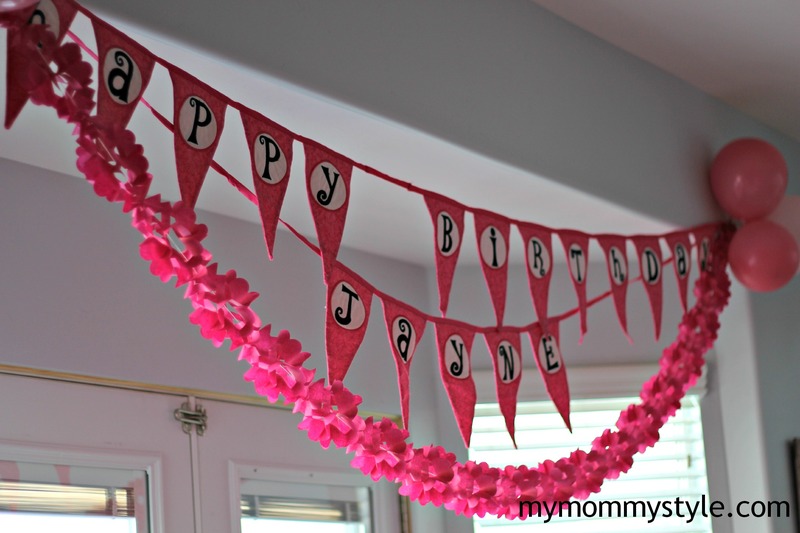 With recently having a newborn I didn’t know if I could pull off throwing her a birthday party this year. I realized that with her birthday being the day that it is she can often be passed over with the business of the holidays and also with all of the get togethers and sickness going around we haven’t been able to get together as much. So I decided what the heck I am going to do it. 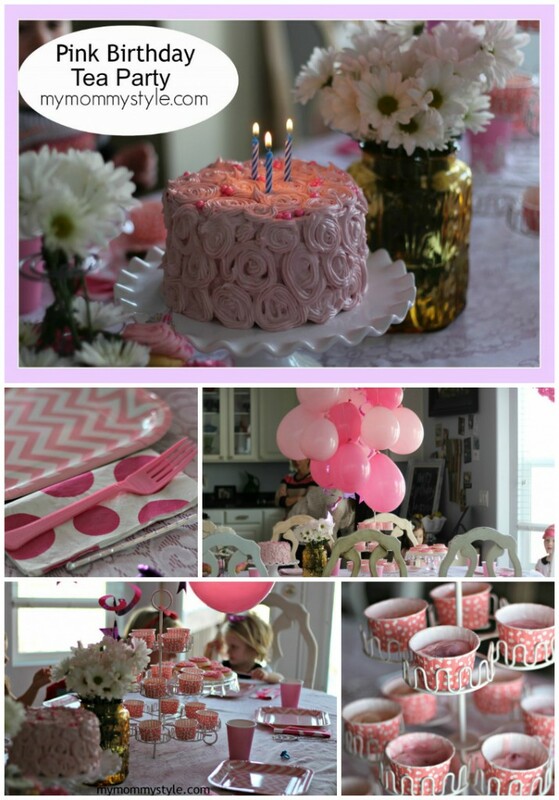 When I asked her what kind of birthday she wanted all she said was that she wanted a “Pink Birthday” and because she recently got a tea set for Christmas it is inspired me to throw her a “Pink Birthday Tea Party.” You can follow some of the ideas I pinned on pinterest here. I decided to put together a few trays of kid friendly foods like peach and strawberry yogurt to give the princesses their choice if they didn’t prefer strawberry. 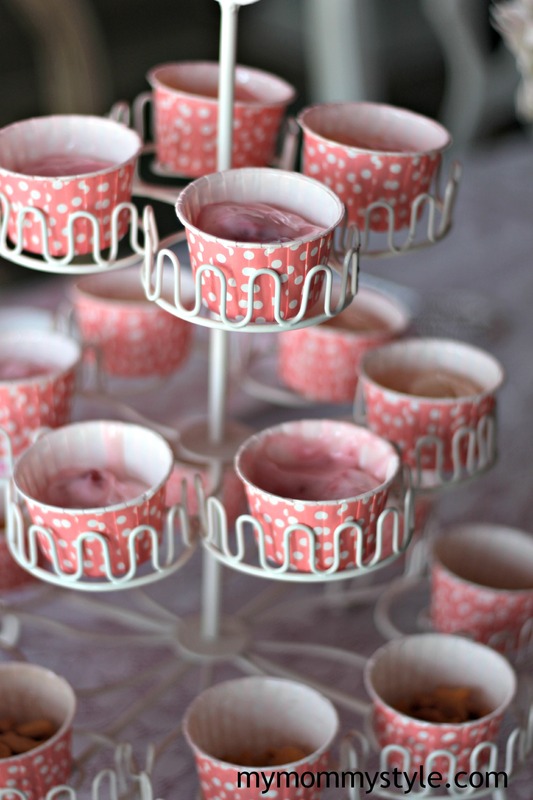 These cute cups were found at Pick Your Plum, they are always providing cute birthday supplies. I actually bought these a year ago and have held onto them. My mom made this embroidered birthday sign and I love that I can use it again and again. When I tell you I threw this together last minute, I am not kidding. I sent out text message invites, made the cake the day before, asked my neighbors if I could borrow some pretty dishes, and used a lot of party supplies that I already had on hand. I find that kids don’t care too much about all the crazy details, they just want to know that you are thinking about them and it is their special day. I wanted all of the girls to feel like they were about to have a special tea party lunch and to get into the spirit of it all “Nana” dressed up as a princess and we adorned all the little cuties with a tiara, ring and wand. We brought them into the family room and had them dance to “Bibboty, bobbity, boo” it got the girls feeling excited and girly in no time. Score. How was the music provided? My trusty friend, Bobbie, and her trusty iPhone. So here is my professional cake….ha ha. This is my first time every decorating a cake with a cake tip and given that and a bit of a time crunch I think it turned out pretty dang good. The top looked pretty decent…had I had time I should have refrigerated the rows of flowers along the side as I went but I literally had 10 minutes and a hungry newborn to attend to. I was out of vegetable oil and used applesauce instead, the conversion rate is equal. For example 1/4 cup of oil= 1/4 cup of applesauce it cut out tons of calories (added bonus). Guess what? It was so moist and flavorful I don’t know if I’ll ever do vegetable oil again. The frosting was the best part and I am not a HUGE frosting fan…but this was homemade white chocolate raspberry frosting. It was amazing. You can find the recipe HERE. And please don’t judge my cake too harshly once you see hers. Which by the way Baking With Blondie is the genius behind this recipe and I am now, in result, a big fan of hers. We sang. We celebrated. We opened presents. We ended the day hugging our little princess. Mission accomplished.